Take an imaginary trip to Hawaii by playing the Hawaiian game of lu-lu with the dice made in this craft project. The Hawaiians have a long tradition of playing games enjoyed by both children and adults. Many of the games are games of skill, while others are quiet games especially for children. Lu-lu is a very simple game that requires nothing more than four dice and your hands to throw them. The dice in lu-lu are painted, two-sided discs usually fashioned from volcanic stone or bone. In this project, you have the option of making the dice with coiled paper strips or with cardboard discs. At the end of this project page you'll find the rules for playing lu-lu. Related craft: For more coiled paper fun, see the Basics of Quilling. Download and print the pattern for the dice you want to make. Select the 1" Circle Punch pattern or Circle Cutouts pattern, depending upon whether you have a 1" circle punch or not. For coiled paper dice, use the 1" circle punch to punch four circles with red crosses, with one to four dots, for the front of your dice. 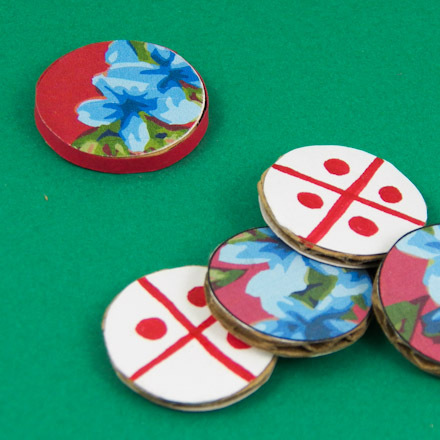 You may optionally punch four circles from the flowered paper for the back of your dice. For cardboard dice, cut out eight circles—four with red crosses and dots (one to four) and four from the flowered paper. 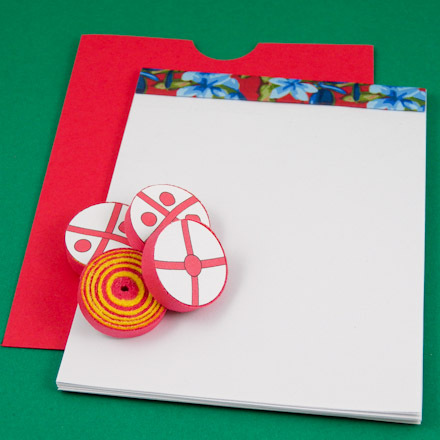 If you would prefer to hand-draw the crosses and dots or the flip-side decoration, cut out the plain circles. Use scissors or a paper cutter to cut ¼"-wide by 9"-long strips from a sheet of 9" by 12" construction paper. 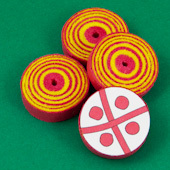 Each coiled paper disc (die) requires about eleven 9" strips, or 44 strips total for all four dice. So, a set of dice can be made from a single 9" by 12" sheet of construction paper. You can mix different colors of strips, if you like. Just keep in mind that you need about 11 strips for each die. Tip: As an aid in cutting strips, download and print a paper strip cutting guide on colored or white computer paper. You can make the dice from computer paper, if you like. To wind a disc, you will need a round toothpick and about 11 strips of construction paper. Put the toothpick across the strip near the top. With your thumb, curl the paper over the toothpick. This will start the coil. After the first strip of paper is wound, put glue on the end of the strip and attach another strip with about a 1" overlap. You may remove the toothpick and continue winding the coil by hand. Be sure to keep the coil tightly wound as you add additional strips. Keep winding and adding strips until the coiled disc is the same size as your punched or cut-out circles. Apply glue to the last 1" to 2" of the final strip. Press the glued area against the coil and hold for a few seconds. Gluing tips: Put a puddle of glue on a plastic lid or a square of wax paper. Use a white glue that dries clear, and apply/spread the glue with a toothpick. Instead of coiled discs, the dice may be made with corrugated cardboard. 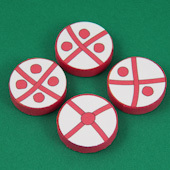 Glue the four front circles of the dice to a piece of corrugated cardboard. Cut out the four circles. For the coiled paper dice, glue a die-front circle to each coiled disc. If you like, you may cover the flip-side with another circle, but the coiled disc usually looks nice with no covering. 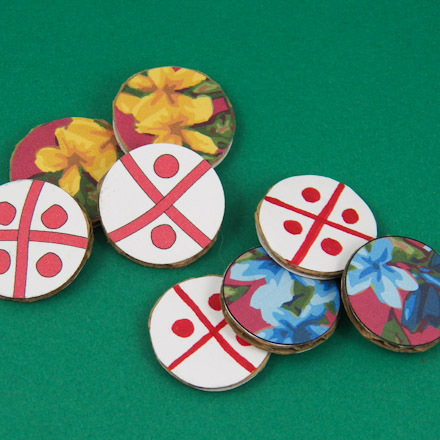 For the cardboard dice, glue a decorative paper circle to the flip-side of each disc. Lu-lu is played by any number of players sitting in a circle. The game is played with four lu-lu dice, and pencil and paper to keep score. Each die has one to four dots on one side and is blank or decorated on the other side. The dice are shaken in both hands and then thrown onto the ground. The number of dots facing up is counted. The object of the game is to be the first player to score 100 points. The dice are passed around the circle and each player throws the dice, noting his or her score. Each player gets two throws per turn. Any dice showing the reverse side on the first throw are gathered up and thrown again. The score for the turn is the number of dots showing face-up. If a player scores 10 on the first throw, he or she throws all four dice again and adds the new score to the total. The most any player can score in a single turn is 20 points, and the least is zero. The game continues with more rounds until one player has scored 100 points total. That's it! Your dice are done and now it's time to play! Tip: These ePapers are inspired by Hawaiian fabric floral designs an colors. Use one of Aunt Annie's Hawaiian Orchid ePaper downloads to bind a score pad for lu-lu following the instructions in the Recycled Paper Notepads craft project. Tip: Alternate two colors of paper strips when winding the strips for the dice. Tip: Use a round pencil or pen as a coiling tool instead of a toothpick. Tip: The dice can be made with corrugated cardboard instead of coiled paper discs. 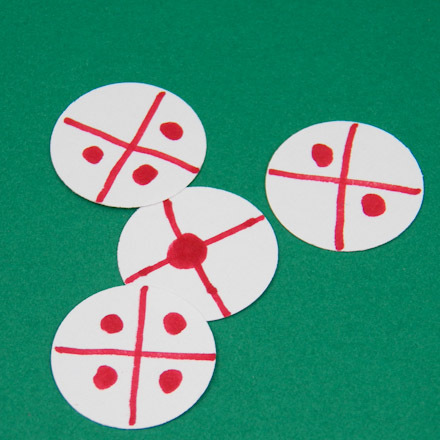 Tip: Quick dice can be made by punching circles from white cardstock and marking one side with crosses and dots. 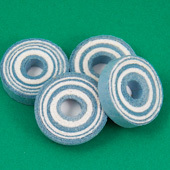 They are a bit hard to throw, but will do in a pinch.